Verena from Wake Up Nijmegen and Wake Up Netherlands shares her aspiration letter to ordain as an Order of Interbeing member in the Netherlands. Sitting with my tea, my laptop and cosy winter lights, I am breathing to feel what I want to share. My practice began close to home, trying to understand my beloved ones and myself better in order to reduce suffering, nourish happiness, and transform some habit energies that were not helpful and live together in greater harmony. After reading several books, my sister encouraged me to visit the monastery in 2009. It was like coming home. Practising with the Sangha made the teachings so much clearer and easier to bring into my daily life. I cannot say how many retreats I have been to since then. Gradually, I was asked to help out, volunteer as a staff, and co-facilitate. It was very natural. The same thing happened back home in the Netherlands with Wake Up Nijmegen Sangha and Wake Up Netherlands. The immense gratitude I felt for the Three Jewels overflowed into sharing the practice with others. This brought new areas of practice because it was clear to me that the doing had to come from a solid place of being. My enthusiasm often caused me to push my limits, resulting in near-exhaustion. Combining family life (including two children), professional life (as a doctor for the frail elders and as a teacher for medical students), social life (which became more and more integrated with the Sangha) and Sangha planning (newsletters, Days of Mindfulness, retreats, emails, Basecamp) were sometimes pretty challenging. I am strong and energetic and recognised, nevertheless, that finding a Middle Way would have great benefits. For everyone. I had been practising with the Five Mindfulness Trainings for several years by then. I had always felt a strong connection to the Fourteen Mindfulness Trainings, too, and became more and more drawn to the aspects of Sangha-building. I thought it would be wonderful to deepen my understanding of the Fourteen Mindfulness Trainings and share with other Sangha-builders about them as well as our challenges with Sangha building. Surely there was much to learn! I was also aware of a certain separation existing in the Netherlands between the Wake Up Sanghas, the all-ages Sanghas, and the Order of Interbeing (OI). This separation had manifested unintentionally, but it was very real. After many conversations on this topic, I decided to be the first Wake Upper in the Netherlands to apply to be an Aspirant for the Dutch Order of Interbeing. I hoped to be the first of many, and I am very happy to say that several Wake Uppers decided to follow afterwards! Being an OI aspirant in the Netherlands meant two years of training in a small group, becoming intimately acquainted with several ceremonies and chants, and practising the facilitation of basic practices, such as walking meditation, meal-time meditation, mindful movements, dharma sharing, inviting the bell, etc., under supervision. The most valuable part for me was the sharing about our practice with the Fourteen Mindfulness Trainings as well as Sangha building and facilitating. And then working with a mentor in our second year, I must admit I cheated there. 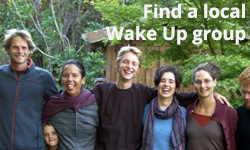 Being involved in Wake Up International meant I was also part of an online sharing group of (potential) Wake Up OI Aspirants. There, I heard that other aspirants sometimes had a mentor for two years or longer and occasionally even had two mentors. When a Wake Up OI friend offered to mentor me halfway through my first year, I happily accepted. To be accepted into the Dutch OI and to be ordained there, it was important to have a Dutch mentor. Marc Jantzi and I focused mostly on themes of Sangha harmony and building mindful living communities. We started our process online through Skype meetings and after about six months, I visited him in the United States when I was traveling to Deer Park Monastery for a Wake Up Ambassadors retreat we were both co-organizing. His style of mentoring is informal, listening deeply to subjects I brought up, and then mirroring my sharing back to me from another perspective. When asked, he shared about his own practice in the relevant areas. My Dutch mentor Jorieke Rijsenbilt was equally helpful and very different in her approach. She challenged me to focus on one question for our one year of working together. Every time we met (alternating through Skype and in person), we had a very clearly structured meeting. I decided to focus on “learning to create space to take care of myself.” This was an aspiration to return to every time and to share about it regularly. I also sent her all the reflections I was writing about my aspirancy process. When we (all the aspirants) were asked to practice with specific Mindfulness Trainings, I got into the habit of rewriting them for my personal practice. After a while, I would read the original Fourteen Mindfulness Trainings again–where new aspects would jump out at me–and a new personal version would be born. My aspirations? To continue to build the Fourfold Sangha. I have a path and I keep meeting wonderful new friends and old friends there; I face challenges and feel the support of the Sangha. I am invited to grow together with others and share the practice in a profound and joyful way. I am determined to grow more inclusive each day and embrace impermanence with as much equanimity as I have space for. So does my ordination into the Order of Interbeing change that? Not likely. I am so grateful for the opportunity I have been given to learn, reflect, and share. Read Verena’s reflections of the Fourteen Mindfulness Trainings here.